Press Pass LA is giving away a pair of tickets to 2 lucky PPLA fans to see Sean Hayes in ‘An Act of God’ at the Ahmanson Theatre in downtown Los Angeles February 9th at 8PM PST. Enter to win! 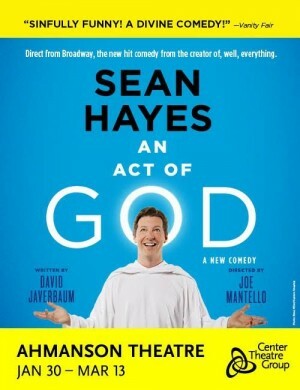 Emmy® Award winner SEAN HAYES (Will & Grace) stars in An Act of God, the sinfully funny and critically acclaimed new play direct from Broadway where God and His devoted angels answer some of the deepest questions that have plagued mankind since Creation. He’s finally arrived to set the record straight… and He’s not holding back! Don’t miss this hilarious 90-minute comedy written by 13-time Emmy Award winner David Javerbaum (The Daily Show with Jon Stewart) and directed by two-time Tony Award® winner JOE MANTELLO (Wicked). Strictly limited six-week engagement begins at The Ahmanson Theatre in Los Angeles on January 30, 2016, followed by a three-week run at the SHN Golden Gate Theatre in San Francisco beginning March 29.